Premiership Rugby chief executive Mark McCafferty is to step down at the end of the season, with Darren Childs named as his successor. McCafferty will depart in June and take up a role as an advisor to CVC Capital Partners. They are the private equity firm that has bought a 27 per cent share in the Gallagher Premiership at a cost of £200million. McCafferty more than tripled media revenues after negotiating three major TV deals and also agreed for US insurance company Gallagher to become the competition’s new title sponsor during his tenure. ‘Mark has played a pivotal leadership role in the development of Premiership Rugby since 2005,’ Premiership Rugby chairman Ian Ritchie said. 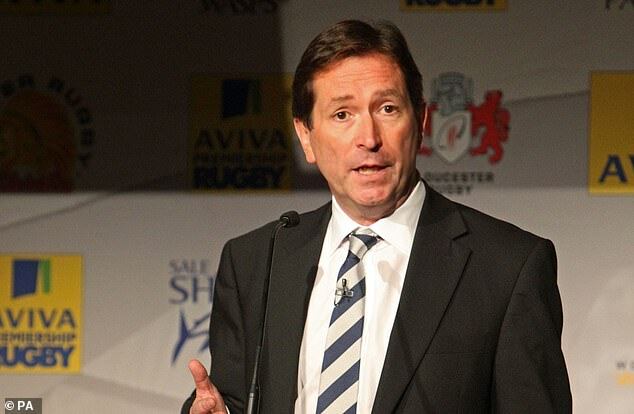 Childs will leave his current job at digital broadcaster UKTV to assume the position at Premiership Rugby. The incoming CEO said: ‘I am excited about the challenge that working in a new industry brings, especially one on the cusp of a transformation like rugby. I have always admired the values rugby demonstrates on the pitch and in the community and it will be a fantastic opportunity to work with the Clubs, and the Board to create even more fans of the sport.